Please Note: I wrote this post over a year ago but never got around to publishing it. Although time and circumstances have changed – everything I say still holds true today! Regina and I decided to take a break from traveling and came home to Canada exactly 1 month ago. 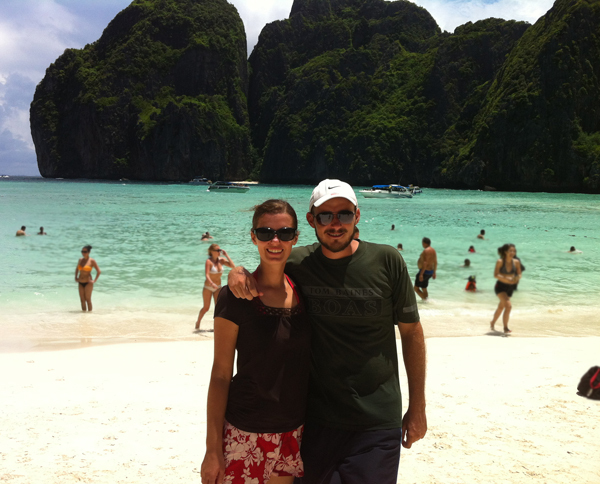 Our original plan was to go live in Thailand for one to one-and-half years and though we were gone for almost a year and half, we spent that time all over South East Asia. It was phenomenal! 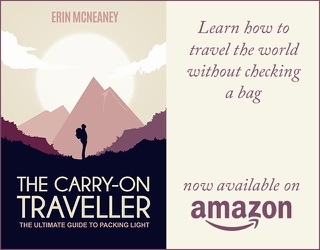 I tried explaining how it had been “eye opening” and how I had learned so much – not just about the people, nature, or history of the countries we’d been to – but much more so about myself. Now, we did not set out to find ourselves by “becoming monks in Thailand” or “learning to meditate in Bali” like many have done before (the idea of either is intriguing though). We simply wanted to see Asia and explore a new culture – but boy… our lives will never be the same again. One of the biggest personal realizations I came to is how we can get so attached to “things”. These can be physical things like a home, cars, friends, family, or even jobs. They can also be non-physical things like traditions, beliefs, perspectives, attitudes, pride, etc. As I hinted at in my last post, we (while traveling) very quickly started to look at how little “things” we could live comfortably with instead of “how much can we possibly travel with”. It was a freeing shift in the way we looked at earthly possessions. Sure it would be nice to have a huge mansion to play hide-and-seek in or to have a beautiful Porsche parked in the drive-way, but the thought of either is not very “freeing” to me anymore. Not saying they are bad things to have – but am simply saying that at this point in life I’d much rather not have it and be traveling. Maybe a different way of looking at it is: instead of striving for the next shiny object, our whole drive has become all about the moments and the experiences. Learning new things, becoming all we can and are meant to be. To look at ourselves realistically without having our vision clouded with “things” or even with the expectations of others. In a sense, we are no longer slaves to the material world. We let go of it and are finally able to breath, smell the flowers, hear the birds, etc. We stopped worrying about “things” back home or having to be anywhere at a specific time. We were truly able to embrace the moments as they presented themselves to us. I am not saying that having possessions is bad, but now being back in Canada and being around people that buy new “things” on a regular basis “just because”, I can’t help but feel sorry for the trap of “short lived joy” they find themselves in. Or… now that the days are warmer here in Calgary, I sometimes go for a walk down the street and see the odd garage door standing open and it is packed to the top with “things”. Heck, a great deal of the garages don’t even have room anymore for a vehicle and they consequently park their 3 or 4 cars in the drive-way. The ultimate question everything boiled down to (for me) was: Who am I? When I remove myself from all the short-lived possessions, all the brain-washing and mental programming I had grown up with, all the friends, co-workers and business associates, etc – who am I really? Removing myself from an environment I had gotten comfortable in and exploring (for an extended period of time) environments completely foreign to me, helped me to look at everything I knew (or thought I knew) from a different perspective. I would not consider myself “all enlightened” by any means, but traveling South East Asia has changed my view on what is truly important in my life – and that alone was worth the trip. I would just like to say that this post is truly inspiring and true! 110% agree that possession is not everything, maybe to some that aren’t perhaps interested in travel, but its so much better than owning 2 or more cars, or buying a new ‘prada’ bag for example. Travel makes you a richer person i believe. I’ll be travelling solo in a few months around SE Asia so i’m really looking forward to it! Where abouts in SE Asia? Was just trying to come up with a name for my as yet to be created travel blog, and Nomad’s Dream was on top of my list so I googled it to see if it was taken and found your site. Looks like I need to keep thinking, but wanted to say that I really enjoyed reading your post, it echoes exactly my feelings on travel. 7 years ago I walked coast to coast across England, then the following year I spent a month in Thailand & Bali, plus 3 months by rail across Europe. Friends were envious but I was only able to do it by selling virtually everything – I had no house or apartment or furniture or appliances or closets full of clothes, just what fit in my small car. Now, 6 years later, having lived a “regular” life with job & apartment, I was laid off, sold my possessions once again & am poised to travel around the world, at least as long & far as my small retirement savings will get me. Thanks for your post. Please let me know if you’re not using Nomad’s Dream, as I love it for a blog name…also would love to hear more abt your trip!! Very encouraging to hear from you Lynn! Regina and I just decided (last night) that we will be moving back to Thailand for a year by March of next year. We came back with the intent of making some money, taking care of old paper work (mainly taxes), pay off random debt we accumulated over the years, etc. While here we found out that we were pregnant and had a baby girl (now 3 months old). We have been here now 18 months, but like you said: We can’t wait to get back on the road again. The plan this time around is to not rely so much on savings, but to be 100% self supported through our online businesses (Regina’s food blog & my marketing ventures). Are you planning to revisit SE Asia this time around? I’ve been reading the comments and was wondering what you guys meant when you said you want to be 100% self supported through your online businesses. I was hoping you could elaborate on that and how that could be accomplished? I’m curious because I understand it’s what’s called being a digital nomad basically? Excellent question. At this point we are 100% self supported through our online businesses (Regina’s food blog and my other ventures) and are also back in Thailand again, yay! For us – being self supported basically means we don’t have a job to go to and that we have managed to grow the income off of our online projects (blogs mainly) to a point where we earn more than we need to live on. Digital nomads is the term used to describe us, correct. I know a popular move is to start a travel blog, but as my post (that will go live in a few hours) explains, we chose to neglect this travel blog temporarily for the sake of focusing on our other projects. I suppose we could do a series down the road on exactly what becoming a digital nomad looked like for us, but the key thing – for us – was this: Start a blog on a topic you’re passionate about, get committed to putting out useful content on a regular basis (1 to 3 times per week), and then optimize the site with either third party ads, affiliate links, or our own product. We have also done sponsored posts and other brand related work when the pay is good, but we’ll likely get away from that eventually. I see a lot of digital nomads in coffee shops here who are freelancers – where they work for someone else (they are oftentimes writers, web designers, etc) – and although Regina and I have both done a bit of that in the past, it is a stressful way to make a living. We both prefer being our own bosses and hence focused on creating strong assets (our sites) that we can leverage instead of our time. PS: – I just remember I wrote a bit more about this process on my SEO blog. See post here!